Are you looking for an an easy, nutrient dense dinner in 30 minutes or less? One that’s vegan but even your most carnivorous eaters will love? Step right this way. 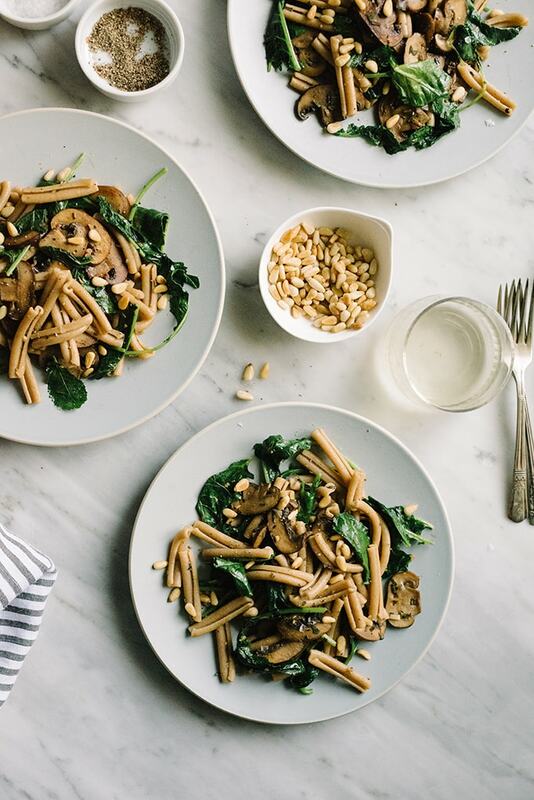 This kale mushroom pasta is packed with awesome. 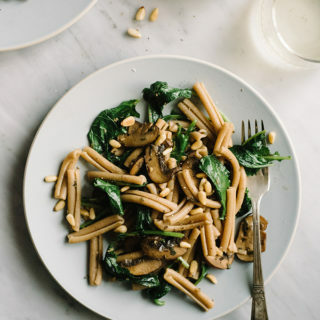 With tender baby kale, crispy mushrooms, toasted pine nuts, and lots of fresh herbs, this pasta is bursting with flavor. Are y’all ready for a super easy, super fast, family-friendly dinner that’s on the table in less than 30 minutes? I thought so. Kale mushroom pasta for the win. This week is nutso for us. Cameron has freelance jobs every night this week. Cassian is busy with baseball and Asher just learned how to crawl, which means that my days are spent digging random junk from his mouth that he’s uncovered from the darkest corners of our living spaces. Rosie the Roomba is gonna be working overtime the next few months. This week I’m all over fast and easy dinners. And even though Cass has requested mac n’cheese at least 3 times, I haven’t caved (yet). Last night this kale mushroom pasta with whole wheat noodles saved dinner. With just a few simple ingredients (that I already had on hand – score!) and some leftover wine, dinner was on the table in less than 30 minutes. Even bigger score? This recipe is super nutrient dense and packed with tons of flavor. Full and happy bellies for all, with time to spare for a walk after dinner. I swear I felt like a freaking super hero. Pin it now! 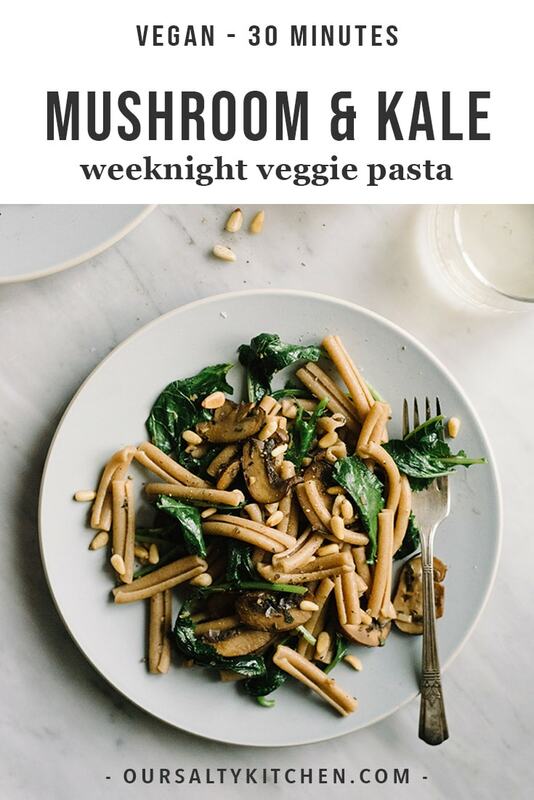 Click here to add this Kale Mushroom Pasta to your Vegetarian Recipes Board on Pinterest. Julia Child famously said “I enjoy cooking with wine, sometimes I even put it in the food”. 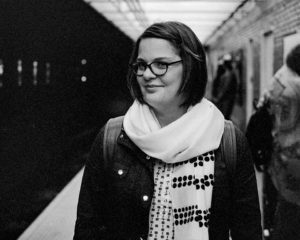 If you’ve followed this blog for any length of time, you’ll see that I take her advice to heart (at least the latter part). Exhibit A…and B…and C.
Wine is a really easy way to impart deep flavor to most dishes, and I particularly enjoy adding it to vegan dishes for an extra layer of complexity. It adds depth and sweetness to tomato sauce, makes for an excellent braising liquid, and adds subtle acidity to sautéed vegetables. Hands down my favorite way to cook with wine is in a quick pan sauce, like in this kale and mushroom pasta. I sauté the mushrooms until they are golden brown and crispy, toss in some herbs, and deglaze the whole mess with a few glugs of dry white wine. Instant savory pan sauce with the perfect balance of fat and acidity. Heaven. 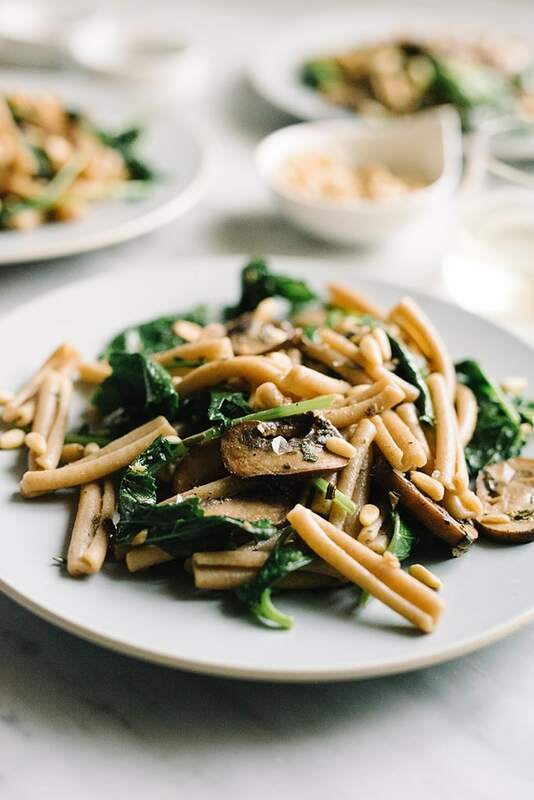 The magic in this kale mushroom pasta comes from crispy, deeply flavorful mushrooms. When properly cooked, mushrooms are savory, umami packed wonders that easily take the place of a typical protein. Preparing golden brown, perfectly sautéed mushrooms is so easy, but requires a bit of patience. You’ll need a heavy bottomed skillet (I’m a cast iron devotee), fat of your choice (butter, avocado oil, etc), and time. First, get your skillet nice and hot. Add your fat of choice – I like equal parts butter and avocado oil. Butter for flavor, and oil to help prevent the butter from burning. Add a handful of mushrooms to the hot fat, taking care not to overcrowd the pan (overcrowding leads to steaming, not crisping). Toss the mushrooms to coat in the fat, and then wait. Sear the mushrooms undisturbed until they’re browned and crispy. Flip them, and repeat. Once the first batch is finished, push the mushrooms to the edge of the pan and add the next batch. Repeat the sautéing process until all of your mushrooms are perfectly, lovingly sautéed. At the very end, you’ll deglaze with wine and season with salt and herbs. Check out my post for Warm Mushroom Salad for all of my sautéed mushroom tips and tricks. You’ll be a mushroom sautéing pro in no time! 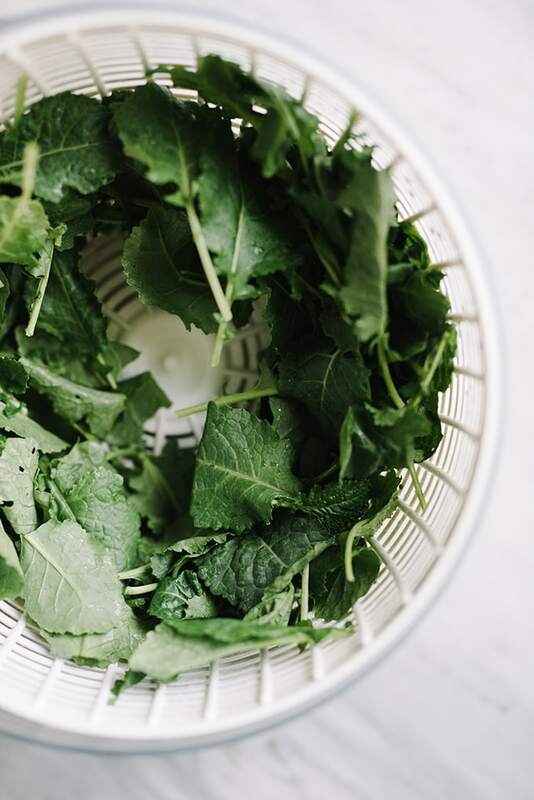 I used baby kale because it’s what I had in the fridge, but baby spinach or swiss chard would be delicious as well. A baby variety works so well because it only takes a minute or two to wilt, and keeps this recipe in the under 30 minute category. 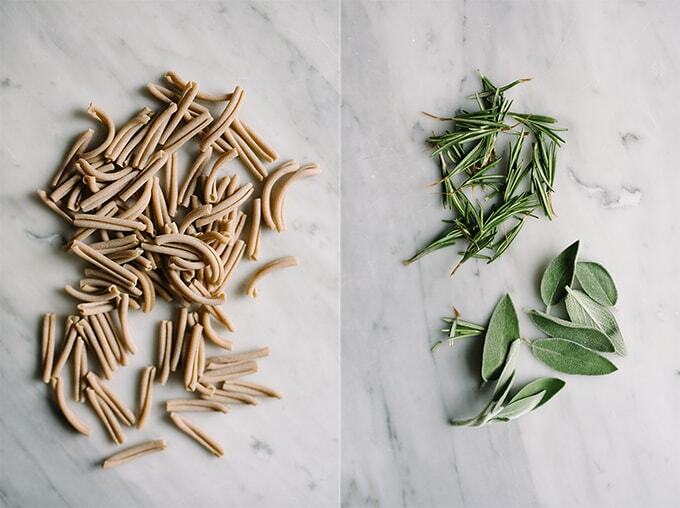 The herbs I potted last month are finally gaining some steam, so I grabbed a few springs of rosemary and sage for this recipe. But don’t limit yourself – lots of fresh herbs will work for here, including thyme, tarragon, oregano, and basil. A note on seasoning. For pasta dishes, I like to season at the table with flaky table salt (like maldon) and cracked pepper. Feel free to season in the pan, this is simply a personal preference. I added some toasted pine nuts because I found a stash in the pantry. If you have some, fresh parmesan would be a nice touch as well. Make it Carnivorous: add grilled chicken or salmon, or pan-seared shrimp. For shrimp, add them just after the mushrooms have finished sautéing. Push the mushrooms to the edges of the pan, add a bit more fat, then add the shrimp and sauté until pink, 3-5 minutes depending on size. Then proceed with the remainder of the recipe. PIN IT NOW, MAKE IT LATER! CLICK HERE TO PIN THIS Kale and Mushroom PASTA RECIPE! WHILE YOU’RE AT IT, LET’S BE FRIENDS! CLICK HERE FOR EASY, SEASONAL RECIPE IDEAS. An easy, nutritious dinner in 30 minutes or less? Yes, please! 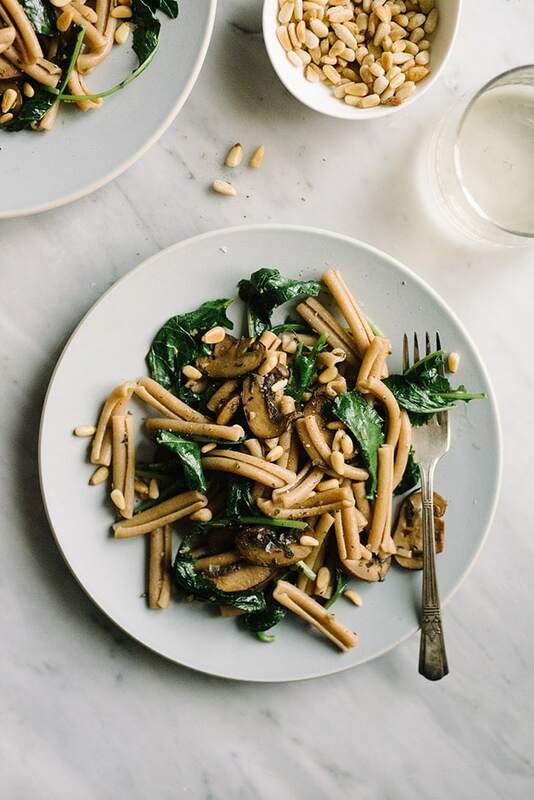 This mushroom and kale pasta is a fast and easy dinner that's packed with flavor. In a large stock pot, bring 4-6 quarts of water to a boil. Add 2 tbsp kosher salt and boil the pasta according to package instructions. While the pasta water is coming to a boil and the pasta cooks, prepare the vegetables and pan sauce. Place a large, heavy bottomed skillet (like cast iron) over medium high heat. Add the butter and avocado oil and heat until the butter foams and subsides. Add about a third of the mushrooms to the pan and toss to coat in the fat. Saute the mushrooms, undisturbed, until browned and crispy. Flip and saute on the other side. 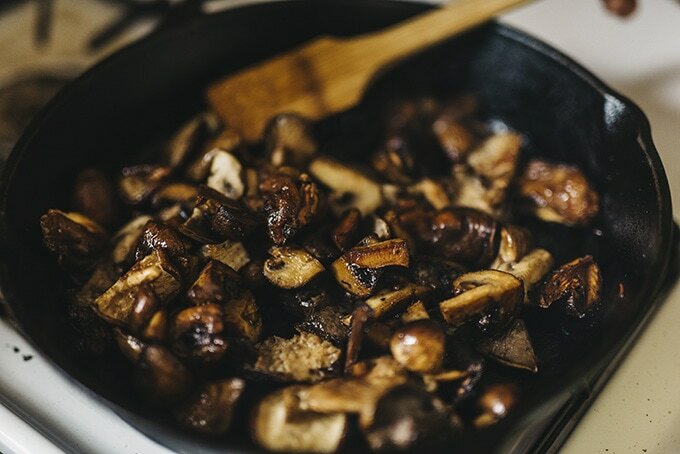 Once the first batch is finished, push the mushrooms to the edges of the pan, add a bit more fat if the pan is dry, add the next batch of mushrooms, and repeat the sautéing process. Continue until all the mushrooms are sautéd, 15-20 minutes. Push all mushrooms to the edges of the pan. Add another teaspoon of butter or oil to the center of the pan, and add the garlic. Sauté until the garlic is fragrant, 1 minute. Sprinkle the minced herbs and a pinch of salt over the mushrooms and stir everything together. Sauté, stirring continuously, until the herbs are fragrant, but still bright, 2-3 minutes. Pour the wine over the mushrooms and herbs. After the initial fizzle, add the kale to the pan and sauté with the mushrooms and pan sauce until the kale barely wilts, 1- 2 minutes. Drain the pasta and toss with the mushrooms, kale, and pan sauce immediately. Dress with the juice from 1/2 a lemon. Divide onto 4 plates and garnish with salt, pepper, and pine nuts. Serve immediately. I love using my 10" Lodge cast iron skillet for sautéing mushrooms (and everything else!). It's excellent at retaining heat, which translates to super crisp mushrooms every time. A well-loved cast iron pan will last a lifetime, so it's totally worth the small investment.